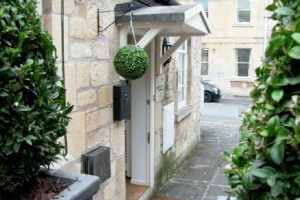 The Old Smithy Loft is a boutique luxury apartment in Bath city centre. The first-floor, spacious apartment is family-owned and managed with two large bedrooms and an open plan living, dining and kitchen space. Multi-award winning and popular with holidaymakers and business travellers alike. Free WiFi and free private parking, a rarity in Bath. The Old Smithy Loft, dating from the late 1800s, is Ann and Michael’s family-managed luxury apartment. It was once the workplace, or “smithy”, of local blacksmiths. The Old Smithy Loft retains much of its original charm and is built using the iconic Bath Stone. Inside, the furnishings are modern and elegant with a recently-renovated kitchen and family size bathroom. The two large master bedrooms sleep four guests, either in twin beds or super king sized doubles. Furthermore, the luxury apartment is only two minutes’ walk from the beautiful Kennet and Avon Canal which meanders through Bath. The Old Smithy Loft has a pale modern decor throughout, with a large open-plan living space. In each of the two bedrooms, the king size beds have 1200 pocket spring mattresses wrapped in top quality Egyptian cotton linen. 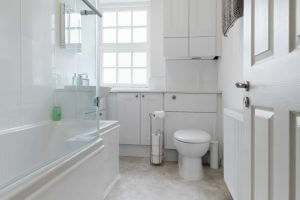 The new bathroom has shower and bath facilities with fluffy cotton towels ready in waiting. On request we can also make up the beds as twins. You can kick-back and relax in the living area with friends and family after a day of exploring Bath’s many sights. Also, there’s a realistic electric fire for keeping cosy at night. The luxury apartment has a dining area space for up to six guests. 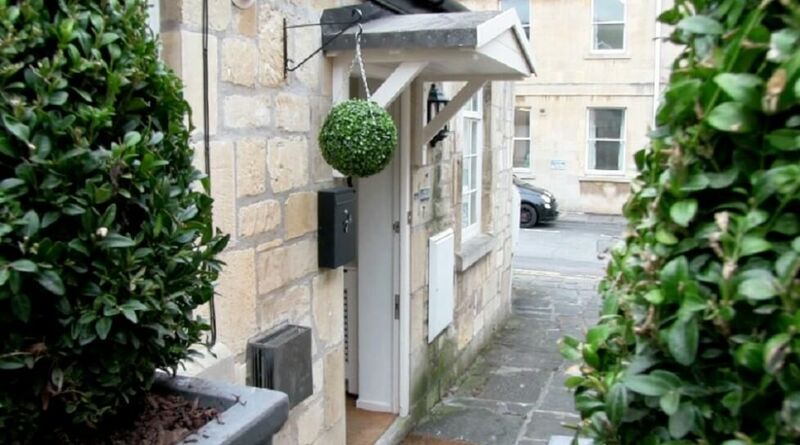 Our luxury apartment is tucked away from the hustle and bustle of Bath in a quiet side street, only a minute away from Great Pulteney Street and the city centre. The Old Smithy Loft is on the first floor in a tranquil setting with your own private driveway and free parking for one car directly outside the property. As a result the apartment offers a home away from home for holidaymakers and business travellers alike. You don’t just have the beautiful UNESCO World Heritage city of Bath on your doorstep! 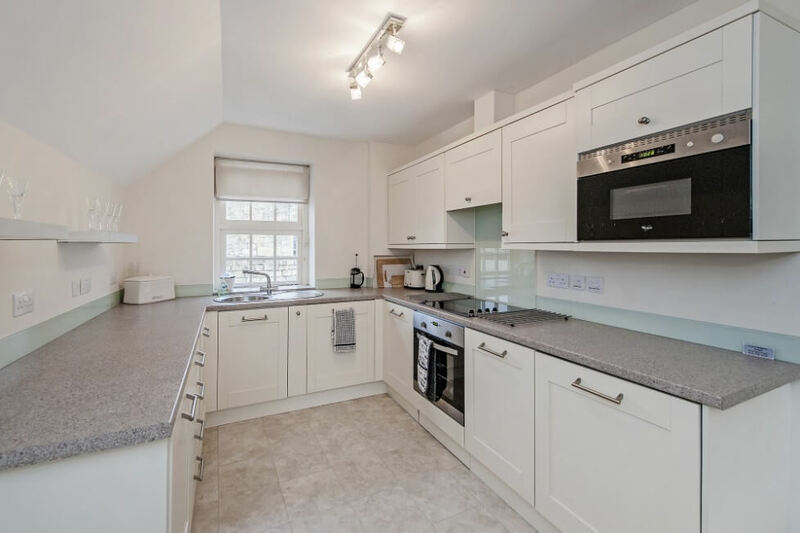 The Old Smithy Loft is in a great location to enjoy the Bath Skyline and Kennet & Avon Canal walks, or for a stroll in the local Sydney Gardens. There is good access to the M4 so you can easily explore the Great West Way via the scenic Cotswolds and beyond towards London and the East. We’re only a short drive to Longleat or Stone Henge for a day visit, or you can stop by in Lacock, Dyrham Park or the Saxon town of Bradford-on-Avon. We’ve added a welcome pack to the apartment with some of our favourite hot spots for inspiration. If you have any questions, give us a call. More – Just for you! Book your holiday at The Old Smithy Loft direct and we will give you 10% off your stay! You can also enjoy discounts at restaurants, cafés and attractions across Bath thanks to the Bath Reward Card. It also includes deals with the Thermae Spa, so you can relax in luxury for less. We’re a proud winner of the ‘Best UK Self-Catering Apartment’ in the Corporate Travel Guide Awards 2017 and the overall winner of ‘Best UK Self-Catering’ in 2016’s Luxury Travel Guide. 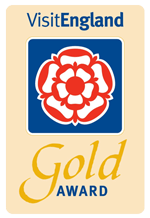 The Old Smithy Loft is also Rated Excellent on TripAdvisor, carries a 9.3+ Rating on Booking.com and we’ve been awarded the rare Visit England 4-Star Gold Award for service and welcome. 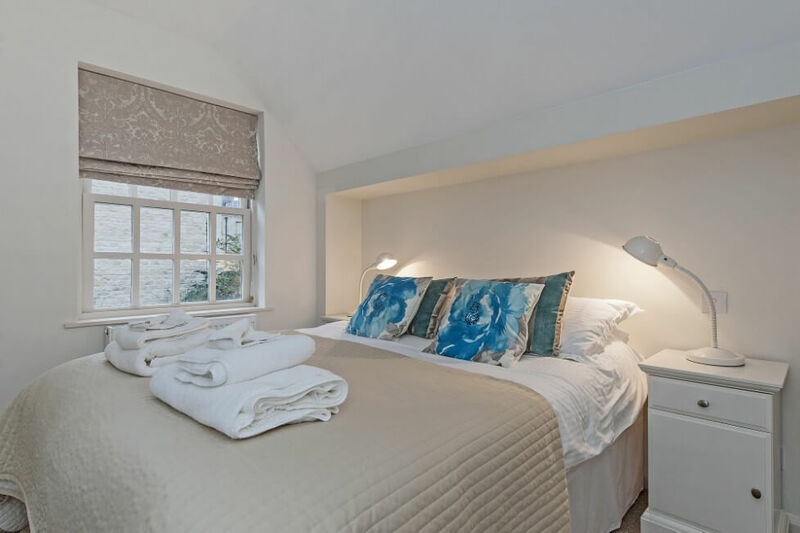 Book your stay and see why people fall in love with The Old Smithy Loft in Bath! The Old Smithy Loft is proudly part of the Bathcitycentre.com Portfolio. Location: Bath city centre (within 700 yards of the Bath Abbey). Bathrooms: Large bath with drench shower. Entertainment: TV in all rooms, DVD player in sitting room, free Wifi, board games, books & DVDs. Outside: Short easy walk to city centre. General Points: Egyptian cotton bed linen and towels provided, luxury 1200 pocket sprung beds and top quality furnishings throughout. Parking: Free off-road parking for one car outside apartment. Arrangements can be made for second car. Train Station: Bath Spa Station is 5 minutes by taxi and 15 minutes on foot. Airport: Bristol Airport is 35 minutes by taxi. Food Stores: Tesco Express is 3 minutes away on foot. Local Pub/Restaurant: Bath City Centre is 600 yards away, awash with restaurants. Very rare to be so close to Bath city centre with parking. Holburne Museum is round the corner. You can walk into Bath by the Georgian buildings on Pulteney Street or via the Canal. The Abbey, Thermae Spa and the Roman Baths are all close by within 700 yards. Longleat, Lacock, Prior Park, the Saxon town of Bradford upon Avon all within easy travelling distance. The University and Bath Golf Club are 5 minutes away by car. Low Season: From: £150 per night on weekdays and £190 per night on weekends for 4, 2 night minimum stay. 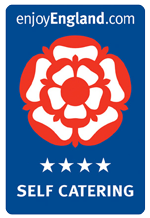 Mid Season: From: £190 per night on weekdays and £220 per night on weekends for 4, 2 night minimum stay. High Season: From: £250 per night on weekdays and £300 per night on weekends for 4, 2 night minimum stay. Short Breaks: From: £170 per night. 10% off when you book direct. No hidden costs. If The Old Smithy Loft is unavailable for your dates, why not try booking our multi-award winning apartment Hedgemead Court?